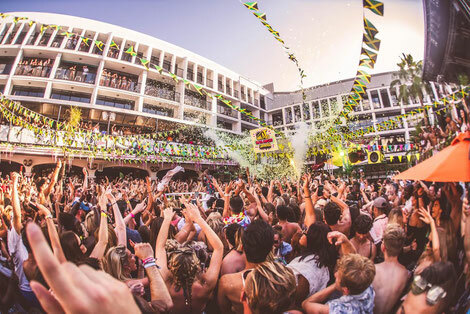 From Notting Hill to Ibiza, the carnival continues this summer at Ibiza Rocks Hotel with four brand new Steezey Wonderland Pool Parties curated by producer and Radio 1 DJ Toddla T, taking place on Tuesdays in June. He will deliver his Carnival soundsystem culture live and direct, poolside and will be joined weekly by names including J Hus, Krept & Konan, Mo Stack, Donaeo & The Heatwave. Rooted in Reggae culture but with a White Isle twist, the Ibiza Rocks Hotel pool will be transformed into a Carnival playground. Steezey Wonderland is a celebration and a lifestyle bursting with the brightest boldest colours, Caribbean fused decor with party-goers shaking, skanking, dutty-whining and twerking to the sounds of dancehall, bashment, grime, garage, D&B, house and popular island sounds. For the past two summers, Ibiza Rocks Hotel has featured a huge mix of exclusive residencies and cutting edge promoters. It has already announced the return of Craig David’s 12-week TS5 residency and Stormzy’s two-day Merky Festival for 2018.